Project:M is a mod for Super Smash Bros. Brawl that ultimately aims to achieve a game more like its predecessor, Melee, yet make it even better. Much hype has been revolving around the idea, so much so that even IGN has given it much deserved public attention. The developers of Project:M have created a multitude of new movesets, character balancing, and stages for what many are calling “Melee 2.0.” Although Project:M is not yet a complete product, the demo is still open to the public for world-wide enjoyment on home Wii consoles right now. The latest update to Project:M now includes a stage themed around Skyward Sword’s Skyloft. With the sheer detail of the stage, it seems as though the developers could not have done a better a job capturing the beauty and essence of the town. As the title theme “Ballad of the Goddess” plays in the background, and the entirety of Skyloft floats behind the fight; it will make players feel as though they can hop off the side onto a Loftwing and fly over to the academy to meet up with Link’s friends. Make the jump and watch the video showcasing the stage. The playing area in itself could be a bit more creative, (the broken pillars seem vaguely familiar to those in Melee’s “Hyrule: Temple” stage), but the fact that the stage is set on a floating island makes its presence around Skyloft natural and believable. You even see Link’s signature red Loftwing fly by the Statue of the Goddess near the beginning of the island’s rotation–it’s that true to the setting. 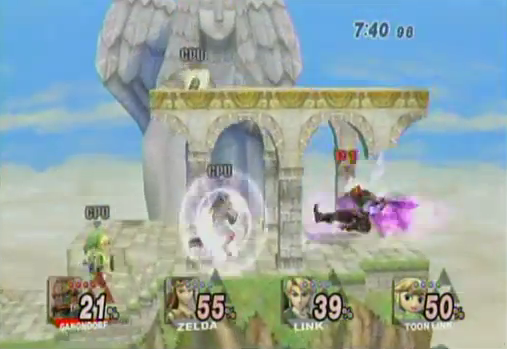 All in all, any Zelda fan will be pleased with Project M’s tribute to Skyward Sword; I know I am. What do you think about the level? What do you think about Project:M in general? Leave your thoughts in the comments below.